A network switch looks like a router, but it is completely different. Your router includes the functions of a switch, but while you can use one router and lots of switches on the same network, you can’t use two routers. A network switch is really simple: if you have 10 PCs and 3 printers that you need to connect to your network, you’ll need somewhere to connect 13 network cables… but your router (nearly all routers!) has only four sockets. Enter the network switch: they come with 4, 5, 8. 16 or 24 “ports” – so that you can connect multiple things together. One of the switch’s ports will have a cable connecting to the router (either directly, or via a Powerline adapter), then all of the others can be used to connect PCs, printers, servers, network drives, set-top boxes, wireless access points etc to. Most switches have an LED (or two) next to each port. In the photo above, there is a green and an amber LED just above each port. They’d light and flicker when the device connected to that port is using the network. For this model, a green LED shows that there is a connection at 100 Mbps, and an amber LED shows there is a connection at 1000 Mbps. All network switches will work at 100 Mbps, and the slightly more expensive ones will also work at 1000 Mbps (“Gigabit Ethernet”) – which is what you should be aiming for really. You can choose between a cheaper plastic router and a more expensive metal one. 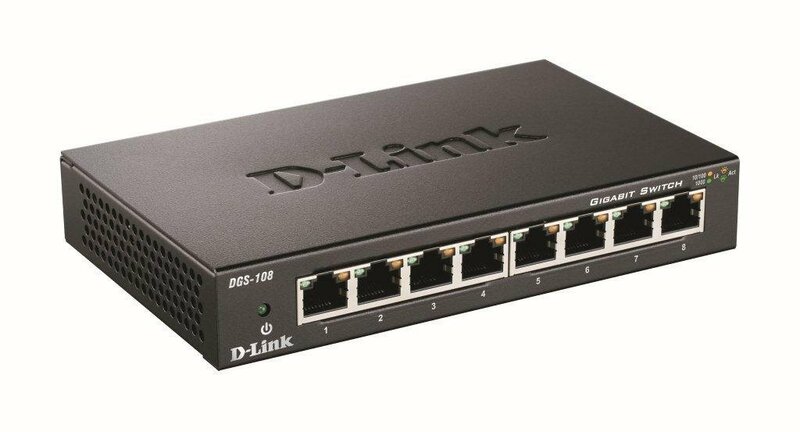 An 8-port metal switch that works at 1000 Mbps is usually less than £25, so they aren’t expensive. Remember when choosing one that ideally it’ll have Gigabit in its name (to mean it’s fast), and metal (so that you’re not buying a plastic one), so all you need to look for is the number of ports that you need. 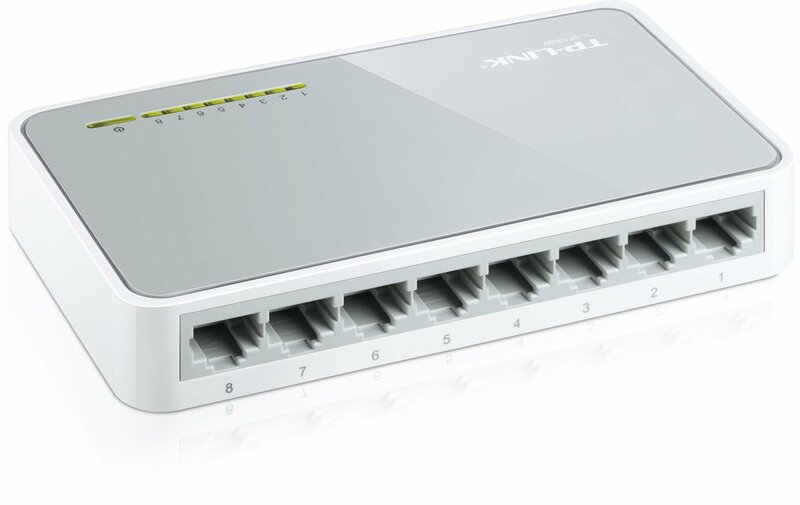 You always need to connect one of the ports to the router, so if you are connecting 5 PCs, you need 5+1=6 ports… so get an 8-port switch, not a 5-port one. Amazon has a long list of different metal Gigabit switches – pick your number of ports and you’re away! Netgear is a decent brand, D-Link, TP-Link and Tenda are cheaper and are fine too.